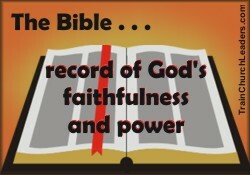 Record Keeping & God’s power? Record keeping and God’s power are not exclusive. The Bible itself is a report of God’s activity containing covenants, genealogies, and other statistics and specific records of events kept to demonstrate His faithfulness and power. God keeps track of what He has made. Based on these records we can conclude that nothing is too hard for Him. We are without excuse to properly respond since we not only can review records of His power but can see it in the outcome. He is a God worth following and worshiping. Why bow to others? Since He is God and they are His people He has the right to expect them to conform to Him and not the other way around. He is a faithful God, capable of bringing about what He promised. God is powerful enough to fulfill His promises, to do what He said He would do. God is powerful enough to do great things with little resources. We should not view record keeping and faith in God as exclusive. He used records as reminders of what He has done and what He will do to help us know that we can rely on Him. Yet, we should not keep records merely for the sake of having records. God kept records for us to learn from them. Our record keeping should therefore be purposeful. Records are most helpful when we make them more about what God has done or is doing in our midst than our own accomplishments. Remember we are a continuation of His might at work, like letters from Christ “written not with ink but with the Spirit of the living God (2 Cor. 3:3). We shouldn’t be limited by the data in front of us for our Almighty God is capable of doing far more than what seems humanly possible.